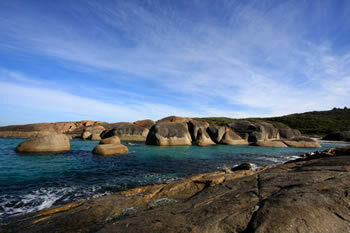 As it name suggests, Elephant Rocks looks exactly like a herd of elephants, paddling in the shallow waters. 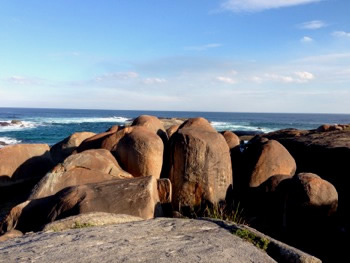 These huge cracked oval boulders make a stunning sight as they gaze out upon the Great Southern Ocean. From the Greens Pool car park it is a good ten minute walk over the rises on a well-kept track to these rugged stone animals. 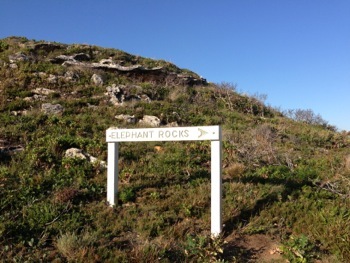 There is also a carpark closer to Elephant Rocks if you take a left and first right when arriving at the end of the entry road to William Bay. PARKING: There are two car parks and two sets of stairs at Greens Pool and Elephant Rocks. Remember which flight of stairs you descended. SAFETY: The Great Southern Ocean can be a few degrees colder than the other oceans, so if you intend to snorkel we recommend a wet suit. 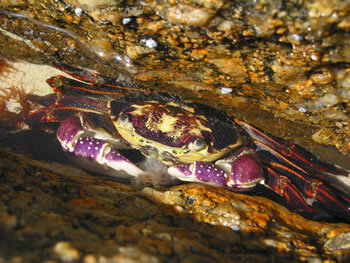 CLIMBING: Be extremely CAREFUL near the ocean. Never leave children unattended. Do not climb out over the rocks. 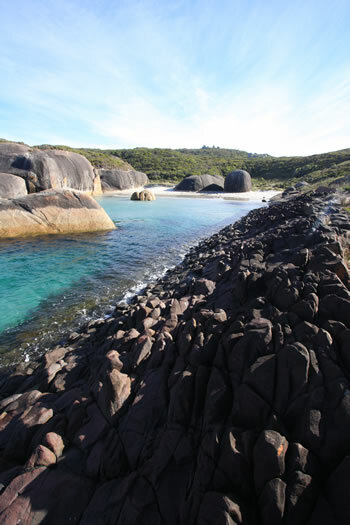 GETTING THERE: Elephant Rocks is on the William Bay National Park Map. Off South Coast Hwy 15k West of Denmark. Descend from Elephant Rocks to Elephant Cove... You can view Elephant Rocks from above and behind or follow the staircase down between the rocks to Elephant Cove, just to the east. 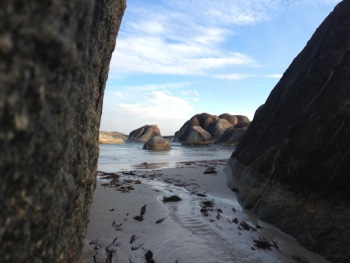 We HIGHLY RECOMMEND going down into the cove for a spectacular view of the rocks. 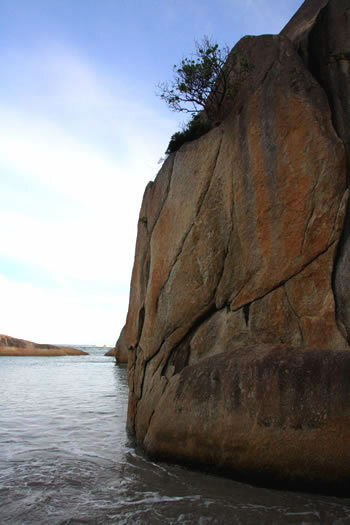 Elephant Cove is accessed via a staircase which descends between the rocks and ends in a beach crevasse allowing you to walk onto the beach. See the video below for the lower half of the staircase walk. Elephant Cove has a sacred feel to it, perhaps because it is rumoured to have been an aboriginal birthing place over the centuries. 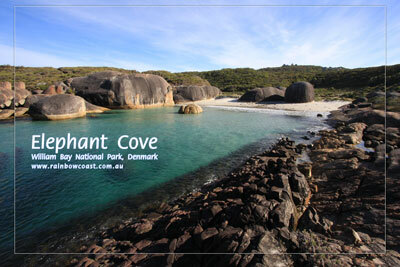 Many visitors to the region say that visiting Elephant Cove was a highlight of their view to the Rainbow Coast. Remember, the Great Southern Ocean coastline is prone to surges, so be extremely aware when climbing or walking close to the waterline. 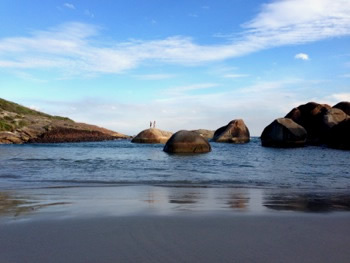 The beach at Greens Pool is protected by the lines of rocks out to sea and are a perfect place to swim. 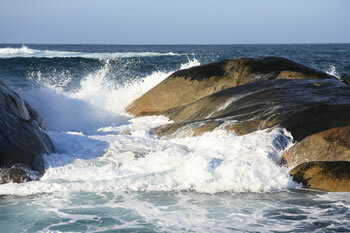 Be careful if swimming at Elephant Cove, the waves can be larger and there is a rip. Follow the track west a few hundred yards to Greens Pool to swim. 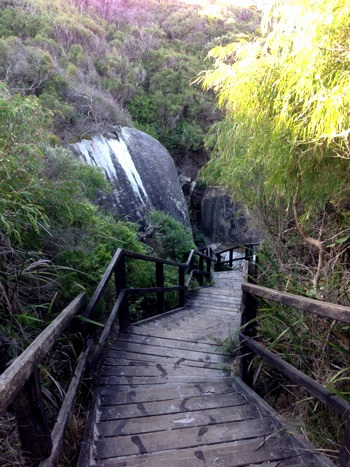 Access to Elephant Cove is down a well-kept wooden staircase and through the stone crevasse. At high tide the water can rush to fill the accessway between the two giant rock formations guarding the entry to Elephant Cove. Elephant Rocks is well signposted from the carpark and once you venture over the rocks to the east of Greens Pool there are also signs pointing the way. 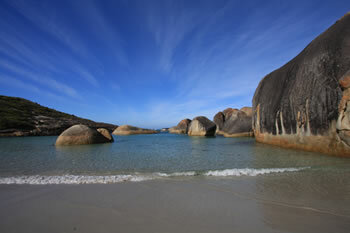 Standing in Elephant Cove in William Bay National Park is a special experience. 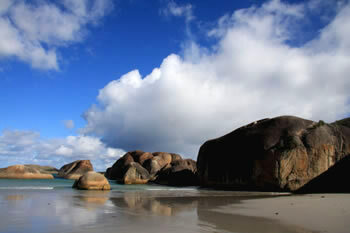 A beach surrounded by giant boulders and volcanic rock, white and pristine. The video above is of the walk INTO Elephant Cove. 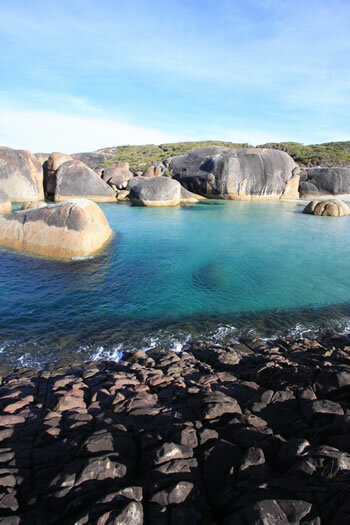 The video below gives you a great view of the surrounding William Bay area, panning fron Elephant Rocks to the calm waters of Greens Pool. The walk to Elephant Cove from the carpark is clearly marked but can be steep in places. 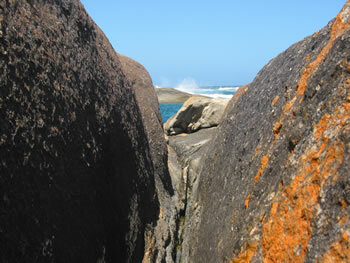 You can walk from Elephant Cove to Greens Pool over the rocks too. Follow the signs!